New generation of portable microprocessor multi-channel ECG. The latest signal processing technology, highly advanced design, original software and integrated telemetry system make UCARD 100 extremely flexible and cost-effective ECG for hospitals, ambulances, first aid and home visits. UCARD 100 features simultaneous 12 leads acquisition and 3, 6 and 12 channel printout with analysis and interpretation. Electrocardiograph is portable and lightweight without compromising the diagnostic quality of the ECG. The unit is easy to use with a carrying case whenever and wherever required. Electrocardiograph UCARD 100 combines compact size and advanced functionality: simultaneous recording of the 12 standard leads, color LCD display, thermal printer, ECG analysis and interpretation, memory, built-in battery, telemetry ECG transmission system. Built-in data transfer telemetry module allows transfer the registered ECG via wire and wireless digital communication channels to a telemedicine consultation center equipped with UNET Telemetry System, and promptly receive a highly qualified cardiologist advice. ECG registration and diagnostic quality ECG analysis regardless of distance and location allows patient receive a remote professional advice as well as maintain digital database. Ability to information input using a standard keyboard. 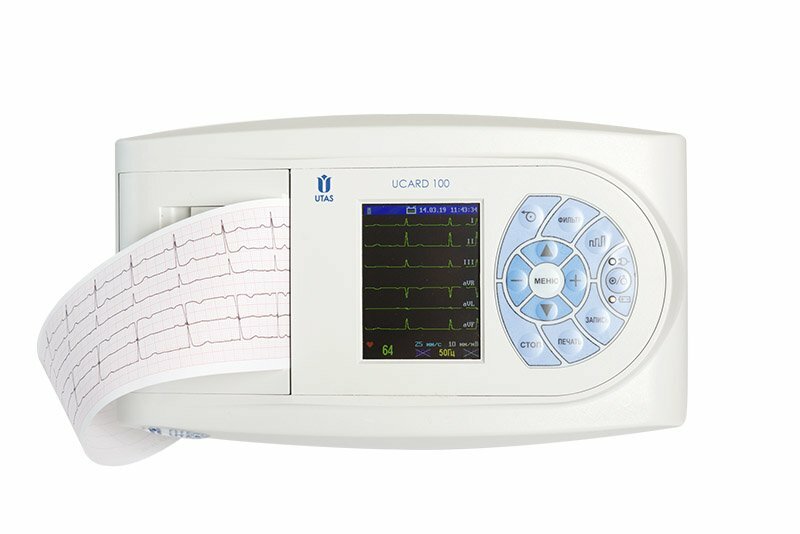 Standard Electrocardiograph UCARD 100 is a basic functional element of UNET Telemetry System. UNET Telemetry System includes a set of software and hardware for receiving ECG in SCP-ECG standard from the electrocardiographs UCARD 100 by wire and wireless digital communication channels, maintaining electronic database of ECG, enhanced analysis, reviewing the dynamics of a patient status on the basis of his electronic medical records, making a diagnostic decision and sending it to the transmitting electrocardiograph or by e-mail, and for a prompt voice communication between a medical advisor and medical staff on site by Voice GSM-modem integrated in UCARD 100. UNET is the informational telemetry system comprising electrocardiographs with transmiter and the telemetry station. The key element of the system is a multi-channel electrocardiograph UCARD 100 with integrated module for telemetry ECG data transfer (there is no need to use additional mobile phone). via network access (Internet, GPRS). ECG data can be transmitted to any spot of the world directly from the electrocardiograph. UNET offers a wide range of tools for handling ECG data: registration, visualization on a display, printing and analyzing ECG directly near the patient, transmitting ECG data to the telemetry station, getting a remote professional advice and managing patient’s electronic health record. ECG Repport can be also sent by SMS or e-mail. Receiving, transmitting and storing ECG data are performed in accordance with the requirements of the standard EN 1064 (SCP-ECG) that ensures their compatibility with major hospital information systems. UNET provides calculation of QRS-complex parameters and analysis of heart rhythm abnormalities, cardiac conduction, myocardial infarction and hypertrophies. Possibility of combining medical cardiology information within the hospital information systems. Automatic generation of the project of Cardiology report. Justification of a particular deviation (indicated by an asterisk). Amplitude characteristics of some teeth and segments (P, R, T, STj, ST) - below the average cardiocomplex. Using a direct connection through the USB interface. Connect a standard USB keyboard. Built-in telemetry module enables electrocardiograph UCARD 100 to send registered ECG by cellular and wire communication channels to the telemedicine consulting center equipped with UNET Telemetry System, and to get a prompt qualified consultation of cardiologist. Possibility to register of high-quality ECG in any place, and getting a remote qualified advice, as well as keeping electronic database of ECG records, establish cardiologic assistance on a new quality level.